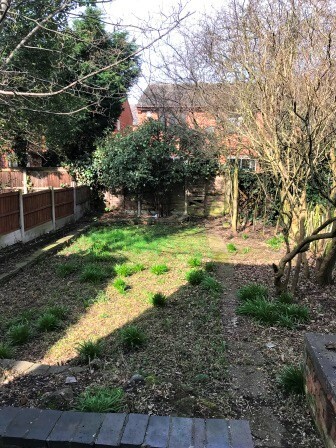 Gardens can often get overlooked when improvement works are carried out to student houses, but having a nice outdoor space can make such a difference to both the street scene and the students’ enjoyment of their home. 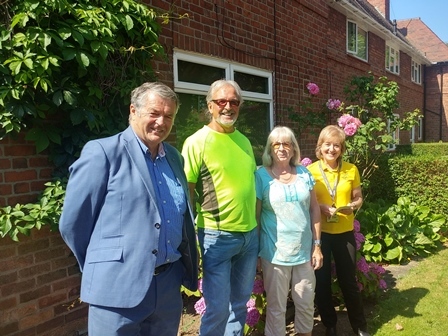 Unipol introduced the garden competition last year in recognition of this and to celebrate those owners who put in that extra bit of effort. The competition is open to all Unipol Code members and several entries were received, of which 4 were shortlisted. 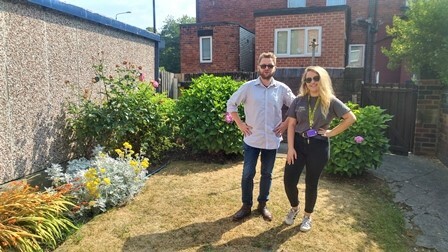 The shortlisted gardens were visited in July by the judging panels – Faye Swanwick (Unipol Student Homes), and representatives from Nottingham in Bloom, Nottingham City Council, Leeds City Council, and Leeds Beckett Students’ Union. The sun was out which made for perfect judging weather! No one passing this semi-detached house would guess that it was a student property. 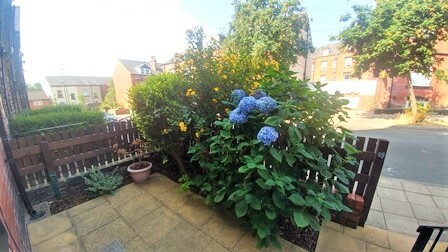 Since buying it 19 years ago the owners have ensured that it has kept its character as part of the local street scene – even down to retaining the old roses and hydrangea planted in the front garden by the previous owner. These offer a colourful welcome to the house. This sense of tradition continues in the back garden, where tall neatly-trimmed hedges offer a good degree of privacy as well as being a wildlife-friendly alternative to fences. Bergenia, more roses and shrubs again create a garden very much in keeping with the house. There is a barbecue and garden furniture, and room to store bikes. All in all, an excellent entry! Recent improvements have transformed a lacklustre plot into a very smart garden. The revamped terrace adjoining the house now boasts a brick retaining wall and black railings, and the landlord has also invested in new fences. Some trees have been removed to open up the garden, which has been mostly laid to lawn. The borders have been planted with shrubs including Euonymus and Hebe, and once these become established they will be an attractive feature. 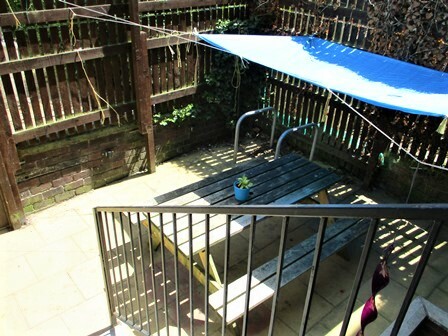 The garden is now a lovely feature of this rented property, and the picnic bench on the terrace will no doubt be getting plenty of use this summer! This garden has it all! There is a lovely lawn, established and colourful flower beds, hanging baskets and a large seating and picnic area. The judges were really impressed immediately upon entering this garden and noted the care and attention that the owner has put into it. The picnic table and additional seating provide a sociable place for the tenants to enjoy the garden, and the varied flowers and shrubs add colour and make the garden a really attractive and usable space. More colour comes from the hanging baskets. All in all, an excellent entry! No one passing this house would guess that it was a student property. 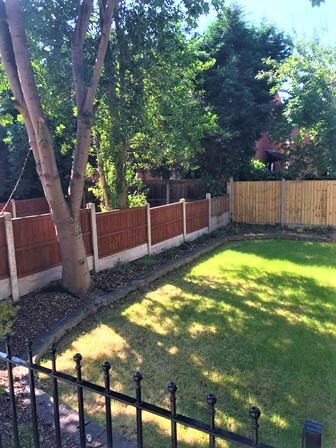 The front yard is very tidy and well maintained, with smart fencing. Hydrangea and St Johns Wart have been planted which add a lovely splash of colour. The back yard has a covered seating area with a large picnic table and bike storage, which really add to the amenities for the students to enjoy. 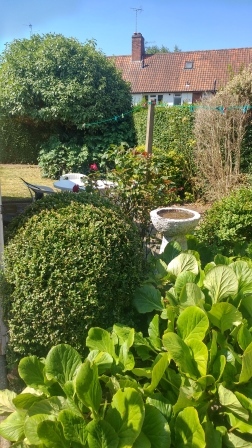 The owner commented that they often get compliments on the garden from the owner occupier resident who lives next door. It is clear that the owner takes a lot of pride in the outdoor space and the garden is a testament to this! 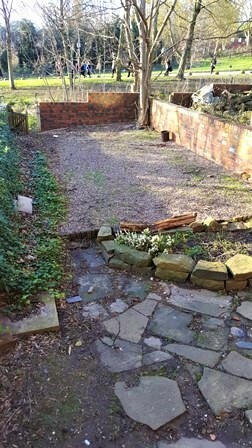 This garden is unrecognisable from the “before” photographs that were submitted with the entry. 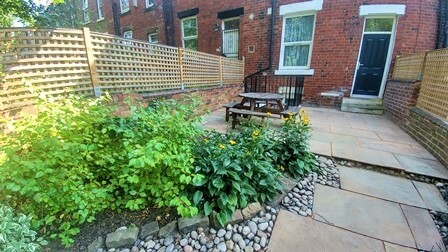 The garden has been completely transformed from a lacklustre plot into a really attractive space, with great amenities for the tenants to use. All judges were very impressed with this garden and agreed that the design was really well thought out. 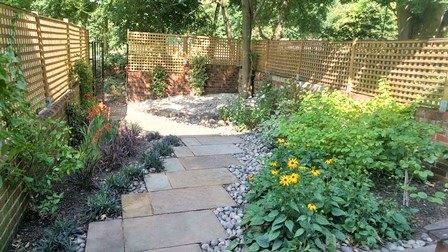 A winding path leads from the back door to the end of the garden, with areas of soft planting created alongside the path, full of colourful and varied flowers and shrubs. 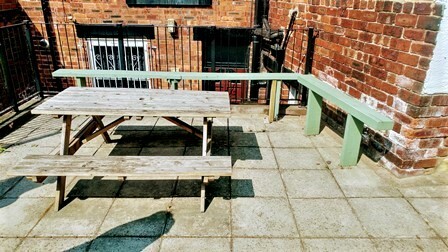 A picnic table has also been provided for the tenants. The trellis around the boundary of the garden looks really smart and provides privacy and shade for the tenants. The judges were also pleased to see the cycle storage that has been provided at the front. The garden is now a lovely feature of this rented property. Next: Clearing? Unipol can help!